A paper published in Nature this week by and Mitra Hartmann and Joe Solomon at Northwestern University in Illinois, describes experiments using rat-like whickers to sense the features of nearby objects. The whickers sweep back and forth while the torque on the base of each whicker is measured. The force on each whisker is interpreted to map out the the shape of the object they are touching. This method requires much less processing than other methods of whisker sensors which used the change in postion of each hair to find the shape of the object. Whiskers can be used by robots to help find their way around on other planets, under water or just working around people. 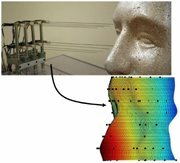 The example they use shows the sensor array sweeping across a face and showing the details. I hope they don't plan to use a face-sweeping robot on people. It looks like it would tickle.